Nissan has released full details of the facelifted Maxima, which made its world premiere at the 2018 Los Angeles Auto Show. The “four-door sports car” gets a stylistic revamp inside and out and receives a few added functional and safety features to boot. On the outside, the Maxima gets a larger front grille with a deeper “V-motion” chrome insert, plus a shapelier front bumper design with more prominent fog light inserts. The headlights are now full LED as standard, while at the back there are quad tailpipes and a rear spoiler on the SR model. Meanwhile, wheel options have also been overhauled with a new 19-inch Hyper Silver option with the Premium Reserve Package, and a new Sunset Drift colour has been added to the palette. The rest of the Maxima’s distinctive swooping design, complete with the trendy “floating roof” look, remains unchanged. 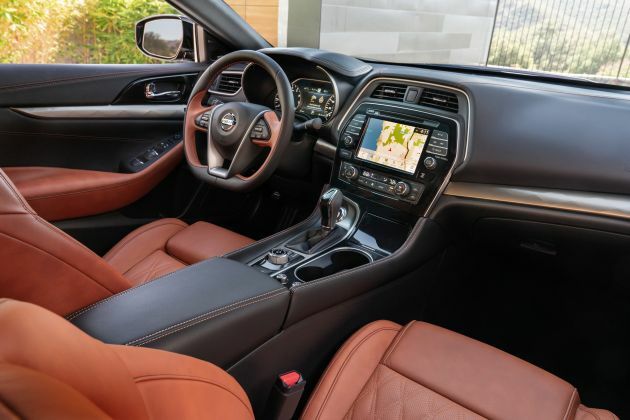 Step inside and you’ll find upgraded materials and trim finishes, with the dashboard, door panels, steering wheel, headlining and even speaker grilles featuring a more premium look and feel. The SR models now get orange stitching, “Dynamic Diamond” quilting, orange Alcantara accents and dark satin chrome finishers, while the Platinum Reserve Package adds Rakuda Tan semi-aniline leather, just like the GT-R. Various other features include the now standard Rear Door Alert (RDA) that warns the driver if they have potentially left a child in the back seat, as well as revised SiriusXM satellite radio and Nissan Door to Door Navigation system, the last of which is standard on all except the base S model. The Maxima is also now available with Safety Shield 360 assists, such as Automatic Emergency Braking with Pedestrian Detection, Blind Spot Warning, Rear Cross Traffic Alert, Lane Departure Warning, High Beam Assist and Rear Automatic Braking. Intelligent Driver Alertness (I-DA) is now standard, while Intelligent Cruise Control (ICC), High Beam Assist (HBA) and Traffic Sign Recognition (TSR) are offered on more models. Mechanically, the Maxima remains unchanged, so power comes from the same venerable 3.5 litre naturally-aspirated VQ V6 as before, making 300 hp and 353 Nm of torque. It is paired to a “performance-oriented” version of Nissan’s Xtronic CVT, and drive is sent to the front wheels. 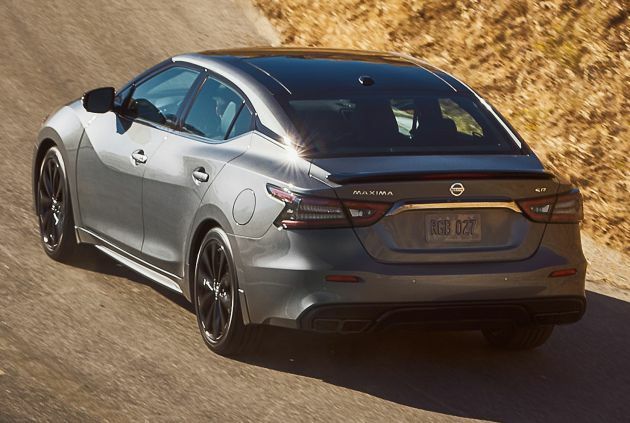 Nissan revealed its two newest models – both assembled in the U.S. – the 2019 Maxima sedan and 2019 Murano crossover at the 2018 Los Angles Auto Show. Both models are set to go on sale at Nissan dealers nationwide in December. 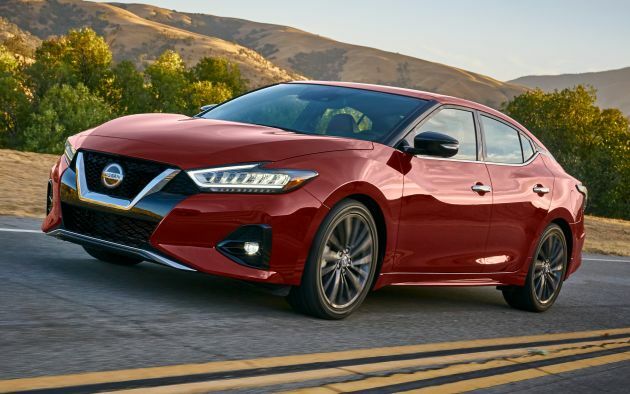 The 2019 Nissan Maxima’s aggressive, updated exterior appearance was created by Nissan Design America in La Jolla, Calif. and features a more voluminous front grille with a deeper V-motion flow that carries into the hood and down the body to the redesigned rear tail lamps and rear fascia. You think people here wanna pay almost RM5k roadtax for a 3.5L in Semenanjung? Anyway that X tronic can take some punishment…353Nm of punishment. Maybe coz the engine is NA and the punishment is gradual. Maxima now uses a 2.0 VT Turbo engine churning out 250 bhp. But ETCM will not be allowed to bring this car in. MITI is always protecting GLC best interest. In other words, until today, GLC still need tongkat. Next time use brain when spewing your usual nonsense so it has some beliability. Maxima is exclusive Left Hand Drive car, so how does ETCM bring this in unless they willing to spend millions just to do RHD conversion?